News category: Press release - published on 06 August 2018. The meeting had an “All-Hands” structure to provide a place to share results, developments and issues with colleagues at different partner institutions who may work on similar issues to stimulate collaborations. During the event, everyone actively interacted with several colleagues. Instead of long presentations, there was the chance for everyone to discuss their topic in small groups. In order to create multiple interest groups, each sessions started with short pitch talks of five minutes when one could promote what they wanted to discuss. The pitches were followed by active working sessions of one hour with the interested people. This gave everyone the opportunity to talk about different subjects in different settings, from code hacking to discussion of policies for facilitating multi-messenger astrophysics. At the end of an intense first day of productive work, everyone was able to cool down during an all-hands session of ice sculpting. The participants were divided in small groups and presented with blocks of ice to transform into pieces of art. The theme chosen for the sculptures was “Multi Messenger” and each group created a different story to present the topic: from traditional telescopes to more modern messengers such as gravitational waves and even alien spaceships. The project and the meeting enabled people with different backgrounds and environments to gather and learn while discussing. 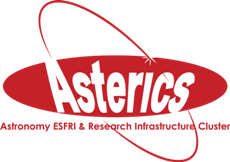 ASTERICS continues to show the success of multi-disciplinary interactions, with astronomers and developers from different fields finding common grounds and working together to achieve wonderful results.